A Maxton and Griffin hug! Everyone say "awwwww!" I'm liking this layout, because I've had the paper forever and I'm so glad to use some of it. Maxton is getting close to 6 years old and I bought this paper to use on a layout of him when he was one. I handcut the leave motif. I've got something really cool in mind using that technique and digital scrapbooking if I can get around to it. I love hand cutting because it's fast and gives an organic feel to your layout. Here I crumpled it and distressed it a bit after cutting. 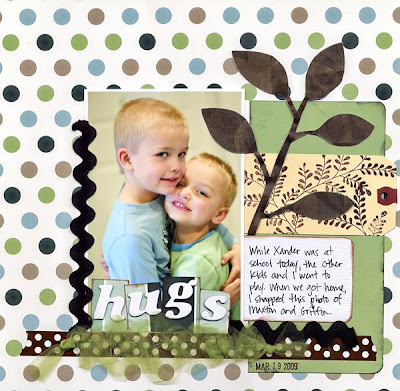 Another great tip is to use tags as blocks of pattern paper. Here I stamped mine and I think it adds another layer of dimension. Paper is Making Memories and Chatterbox, Sticker is Heidi Swapp, Stamp is Cactus Pink (one of my most favorite stamps, EVER), Letter Stickers and Pen are American Crafts. Love this!! So cute. No wonder you love the stamp. I do too!